With the advent of baggage fees (except on Southwest Airlines), it can be confusing to travelers to know what carriers' policies are when it comes to checked and carry-on baggage. So allow us to separate fiction from fact when it comes to checking in luggage and toting your carry-on pieces. You can expect to be reimbursed if the airlines lose your luggage, but there are limits. It is $2500 for a domestic flight. For international travel, the Warsaw Convention applies, which limits liability to approximately $9.07 per pound up to $640.00 per bag for checked baggage and $400.00 per customer for unchecked baggage. If you check items that cost more than these limits, make sure they are covered under your homeowner's insurance. This is not necessarily true when it comes to heavier luggage. If the weight of the luggage exceeds the allowance of your connecting airline you could be charged excess baggage fees, or worse, an airline can refuse to accept the overweight piece completely. If you are traveling on multiple airlines during your trip it is important to check airline baggage policies if your luggage is nearing acceptable limits. The major carriers tend to have similar policies, but low-cost carriers' rules tend to run the gamut. You may not even be allowed to check in excess pieces, and some airlines charge a flat rate per extra checked bag where others may charge for every extra pound or kilogram. Click here to see the rules for the top five U.S. airlines. Not all airlines have ticketing and interlining agreements, which means you will have to pick up your luggage and check in with the next airline. This is especially true with low-cost airlines, which tend to not do interline agreements with legacy carriers. Let's say you're traveling on British Airways from Geneva to London Heathrow Airport and then United Airlines from Heathrow to Chicago O'Hare, don't be surprised if British Airways only checks your luggage as far as London. You will have to go to baggage claim, pick up your bags in Terminal 5, then transfer to Terminal 2 and check in for your United flight. You don't want to think the worst of airline employees or your fellow passengers, but there are always bad apples. If you're carrying an expensive item like a laptop computer or a tablet, it's best to keep it underneath the seat in front of your or in the seatback pocket in plain view. It's very easy for a passenger or employee to go into an overhead bin and take expensive items from your bag, so keep those items within your eyesight. This isn't always true. If your incoming flight is late, there may be time for you -- but not your luggage -- to make the connection. Check your luggage tags to make sure all of your flight numbers are there and go to the baggage passenger service office if your luggage doesn't arrive when you do. Airlines have really done after ancillary revenue, and baggage fees bring in big bucks. The more you check and the heavier the bags, the more you will pay on both legacy and low-cost/budget airlines. This is not true. I recently returned from a trip to Iceland and the Customs dogs were in the area. The dog smelled some food I had, so I was sent over to Customs, where the food bag was x-rayed. Unfortunately, you'll need to tote it with you. London Heathrow and Gatwick are known for this as are other cities with multiple major airports like New York City, Chicago, and Los Angeles. 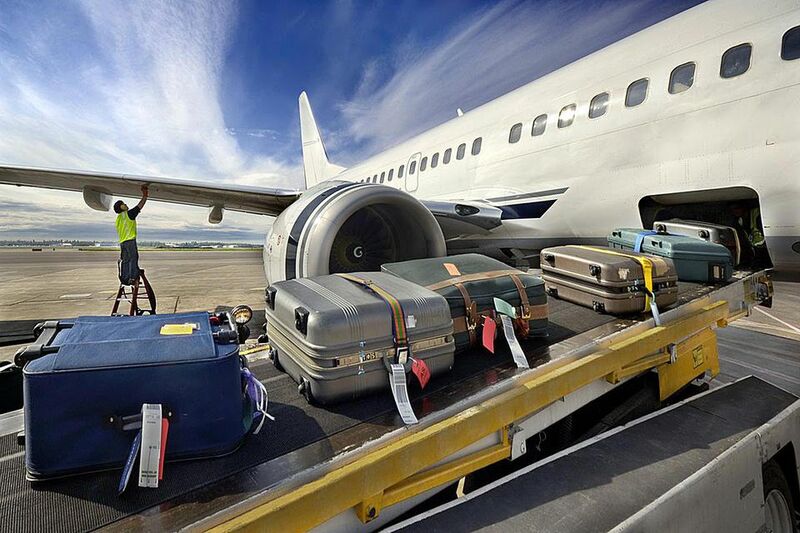 An airline will often deliver luggage if it was lost on a domestic flight, but not if it was an international flight. The luggage has to go through Customs, and Customs may need you to be on premises in case they need to ask you about its contents. Often it will be delivered to you without doing so, but be aware that you can be requested to come into the airport if they so require.